Ken begged me not to tell this story, but I said it was too good to go to waste. So there we were. We had just finished a wonderful lunch at an Italian restaurant one block from the Louvre. We were all so proud of ourselves. Earlier that morning, we'd gotten to the museum and through the crowds basically without a hitch. It was too hard for Ken to walk, so we'd gotten a wheelchair and the audio tour and spent the entire morning just lovingly going through room after room of one magnificent masterpiece after another. 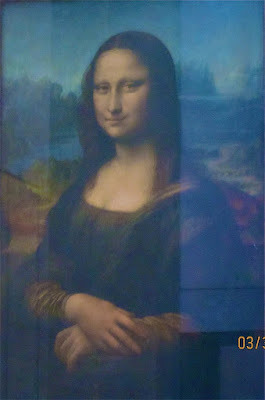 We even got to see the Mona Lisa and Yumiko wedged her way up to the front of the crowd and took her picture. It was raining hard after our museum tour. We gave up the wheelchair and walked the short distance down one Paris block to our Italian restaurant. After lunch, I told Ken and Yumiko to wait on the corner and I would run through the rain and find a taxi. I tried my darnedest to flag one down, but have learned since few taxis will stop unless you go to a taxi stand. I found a taxi stand with many taxi's but no drivers. I went into a local shop and asked where I could find a functioning taxi and the proprietor said I needed to go around the block to the front of the hotel. At the front of the hotel there were no taxis. Again, I asked where are the taxis. Another person pointed down another street and said the taxi stand was there. The rain was still coming down. My hair looked like Bethovan's on a bad day, but I finally found the taxis and jumped in the first one. That's when the trouble began. I thought if the taxi turned right and then turned right again we would come to the little road where the Italian restaurant was. He turned right and right - but no Italian restaurant and no Ken or Yumiko in sight. The taxi driver was in no mood for a dipsy, bad haired American lady. I quickly realized I had no idea where we were, so I told the taxi to stop and I would be happy to pay him. He said it would be six euros!! I had only a 50 Euro note and about 2.65 Euros in small change. He was not happy to have to make the big change, so he took my 2.65 and basically kicked me out of the cab. There I was in the middle of Paris, rain pouring down, a million little streets to chose from, no cell phone and no idea which way to turn. I finally found a sign for the Louvre, and somehow after backtracking, by shear luck I got back to the Italian restaurant and there was poor wet Ken, eyes glazed over wondering where the H I had been. I explained my predicament. He said he had sent Yumiko out to search for me. I told him I would find her and then go back to the taxi stand and get another cab. I headed back up the street, this time with confidence. I knew where the taxi stand was and I was sure I could get back to Ken and Yumiko with no problem this time. I found Yumiko about a block up the street and told her to go back and wait with Ken. I quickly made it to the taxi stand and got in the first one at the head of the line. This taxi driver was much nicer than the last one. I told him exactly how to get back to the little Italian restaurant and in no time we were there. BUT NO KEN and NO YUMIKO. What happened!!?? I asked if the driver could just wait for a minute. He was happy to oblige and parked the cab on the corner. I ran into the Italian Restaurant, but no one had seen Ken or Yumiko. I looked down one block and down another, but nothing. The taxi driver said he would wait for a little while, but five minutes went by and no show. Finally I told the driver, I would pay him, but he shouldn't wait any longer. He wouldn't take any money. (Thankfully because all I had was that 50 Euro note.) It had finally stopped raining. I didn't know what to do. Was Ken so angry with me that he just found his own cab and he and Yumiko went back to the hotel without me? I couldn't believe it. I waited a good 15 minutes. Finally a taxi with another passenger stopped right in front of me. The passenger got out and I asked if the taxi could take me to my hotel. He said he could not do that. I would need to go back to the taxi stand. Ugh.... I felt like crying. I was so disheartened. I started walking back up the block in the direction of the taxi stand - and lo and behold there is Ken. He looked as bad as I did. I said, "What happenned? Why are you here and not in front of the Italian Restaurant?" He said it was too cold there and after the rain stopped, he wanted to stand in the sun. Oh....... He said he had sent Yumiko out for another search for her mother. I could see Yumiko running towards us and she could see that we were both a bit upset. I said to Ken I would go a third time to get the taxi, but he said - NO WAY, we will all go together. And go together we did. We got to the taxi stand, jumped in the first one and all made it back home to our little hotel safe and sound. WHEW,I held my breath the whole time I read that. Glad you all made it, can't wait to see all the photos.